I found this in my mailbox yesterday afternoon. Yes, it’s a real card. No, I didn’t ask for or sign up for it. I have seen ads for it on PayPal’s website, but did not want one, so I ignored it. Apparently they don’t take “no” for an answer, and decided that I needed one whether I wanted it or not. This is truly evil, and here’s the main reason why. 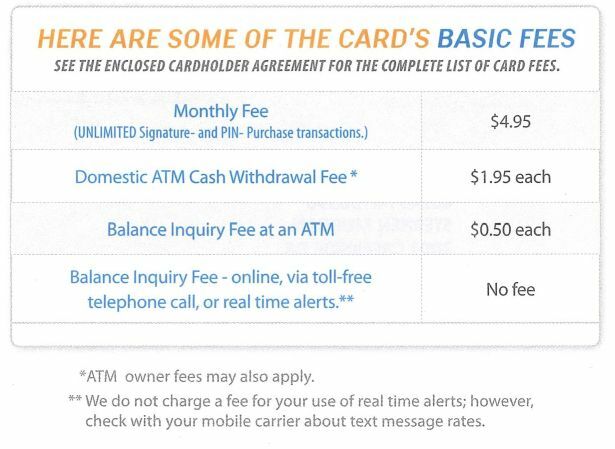 That’s right – if you activate the card, you set yourself up for nearly $60 per year in charges and fees before you have even used the card… all for the privilege of being able to spend your own money. I have two bank debit cards, and neither one costs me a penny – if they did, I would drop ’em like a hot brick. eBay is a de facto monopoly on the web, and PayPal is a de jure monopoly on eBay – they no longer allow other methods of payment. And their behavior stinks. 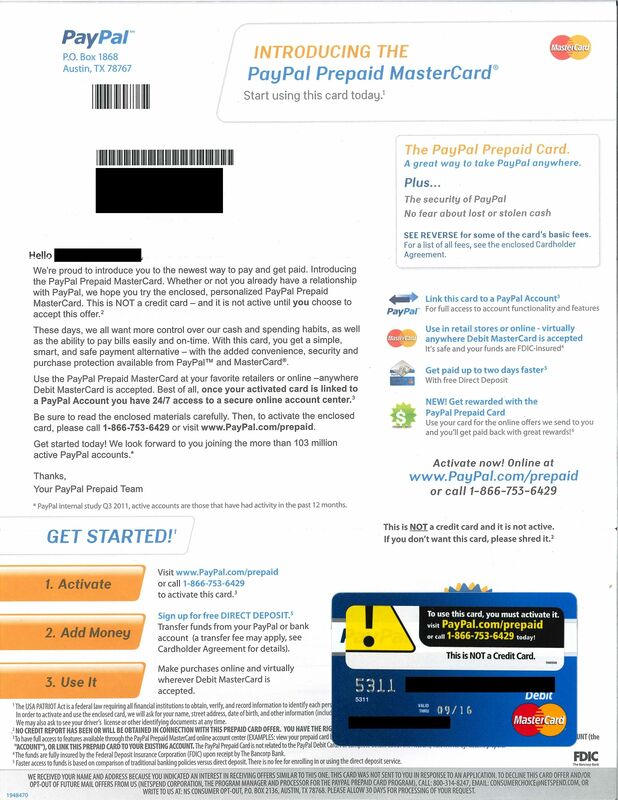 For instance, as a seller, you are required to link your PayPal account to a real-world bank account. In the event of a dispute, PayPal can lock the linked bank account for up to six months without warning or explanation. they can also reverse transactions. This is the main reason that I stopped selling things on eBay and closed my eBay seller account. PayPal does not engage in fractional reserve banking. “PayPal does not physically handle or hold funds placed into the PayPal service”. (er… neither do my accounts with ING direct or Perkstreet Financial – and they are both banks). I don’t know whether or not PayPal is technically a bank. Maybe they are, maybe they are not. But there are few businesses in the world in more dire need of oversight and regulation than eBay/PayPal. If you are as outraged about this as I am, feel free to leave a comment – and write to your Congressman. I recently tried to send some money overseas through Western Union. I went to their website and put in all the requisite information, including my Credit Card information. At the end of the process, almost as an afterthought, I was presented with this dialog. That’s right, folks… MasterCard wants to improve my security. This is a good thing. Visa have a similar feature – “Verified by Visa” – which I have been offered several times in the past and politely refused on every occasion. Unlike them, however, MasterCard would not take “no” for an answer – there was no way to decline this “feature” and still continue to execute the transaction. Security is a good thing – I am all about security – but issuing me with yet another PIN that I have to remember is not security. Most people will probably write it down, and some will probably write it on the back of the card, which nullifies the security in the first place. On an infected computer, the PIN can be sniffed or keylogged, and be on the other side of the world before the customer has lifted their finger from the mouse button. If MasterCard were really serious about security, they could have a person or a machine call or text the customer on their cellphone. This could be inconvenient, but I would rather have real security, even if it meant a little inconvenience. Or they could use a hardware key like the Yubikey. But that kind of solution costs money (about $5 per key, when purchased in thousand-up quantities), which makes it unacceptable to the banks. Some of you may remember when Bank of America offered Credit Cards with the customer’s picture printed on the card. Now that was good security, at least for retail transactions – a quick glance was enough to see that the person was at least superficially similar to the picture. But they don’t make them like that any more. Why not? Because of two small problems: the first was that many cashiers simply did not look at the card, but that could be cured with training and penalties. The main reason was that the pittance that it cost to put pictures on cards added up to many millions of dollars. Since neither the customer nor the bank was on the hook for fraudulent transactions, this was a cost that the bank was unwilling to bear. So rather than bear the cost of security, they scrapped it to save a dollar and a half per card… and offloaded the cost of the fraud on to the merchants. Problem solved. And there, as Jack Sparrow might say, is the rub; the only security that is acceptable to the bank is cheap security. And yet another PIN for you to remember is cheap security indeed. So what did I do? I closed the browser and, after verifying with Western Union that no transaction had occurred, I installed their app on my smartphone. Ten minutes later, the money was on its way, paid from the same card. 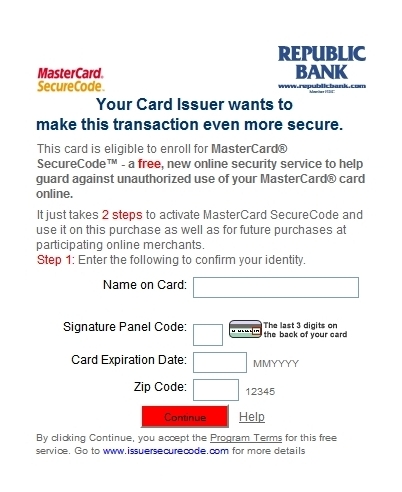 Quickly, conveniently, and without the usual kerfuffle or flummery from MasterCard. Milady and I were conversing with a friend last night, and an interesting topic came up. Some years ago, several banks (BofA and CapitalOne were mentioned) started putting customers’ photos on their credit cards. This widely hailed as an excellent idea. And then, inexplicably, they stopped doing this. The obvious question was “why?”. Why did they stop doing something that was universally hailed as a good idea? So I put my thinking cap on, and came up with some ideas. I remember reading somewhere that the price of putting a photo on a credit card was a couple of dollars per card. Multiply this up by the millions of cards in circulation, and you have a huge expense that the bank has to bear. Credit-card fraud, on the other hand, is not a cost that the bank has to bear. They do a chargeback, which effectively passes the cost on to the merchant. So, the customer is covered, the bank is covered, the merchant gets the shaft and pays the price. That is perfectly legit – it is part of the merchant agreement. There are also many transactions where the merchant cannot see the card; for instance, pay-at-the-pump transactions in gas stations, and internet transactions. Finally, with card-swipe machines in operation at most stores, there is often no need for the cashier to see the card — and too many of them don’t bother looking, anyway. Sometimes “security measures” don’t really do that much for security. And sometimes, the price of security is too high. But I still wish that they would give customers the option to have their photos on their cards. I’d buy that for a dollar. I am a big fan of Dave Ramsey, perhaps the leading exponent of common sense in the country. He has helped literally thousands of families out from under the yoke of debt-slavery. We have purchased – and given away – several of his books, and I regularly listen to his podcast. He is a constant source of encouragement to me and millions across the nation. But there is one area in which I disagree with him, and that is in the use of Credit Cards. His position is simple: cut up the cards and close the accounts. I understand and respect his position; the Credit Card companies have spent billions to try to persuade us to live outside our means and use Credit to fund the deficit. As a result, many people do not know how to use Credit Cards responsibly; they use the Credit Card as their “Emergency Fund”; they carry a balance and pay finance charges; they pay late and attract exorbitant fees. A good friend of mine got badly mauled by credit cards once, and considers them evil. He may be right. Rather than lending money only to those who can afford to repay, the moneylenders rewrote the bankruptcy laws instead. Under the new law, it becomes much harder to declare a “clean-slate” (chapter 7) bankruptcy; instead, people are boxed into a “repayment-plan” (Chapter 13) bankruptcy – which has the highly desirable side effect of securing their previously-unsecured loans by court order. So why do I disagree with Dave on this fundamental issue? Because I don’t use credit cards like most people do. I have not paid any Credit Card interest or fees since 1999…and I never will. A years ago I had three cards. Now I have only one (the other two annoyed me and I dropped them). I have used it twice in the past year. I use my debit card for all of my regular bills and most of my purchases. Having said all that, the simple fact is that there are some situations where a it is more sensible to us a Credit Card than a debit card. Federal law protects you when you use a credit card. Your bank may extend the same protection to your debit card, but they don’t have to – and that courtesy may be withdrawn at will. Bottom line: Your Credit Cards are protected by law; your Debit Card isn’t. When you buy something with a Credit Card, it is not legally yours until you have paid the bill – which gives you some leverage if the item is not as expected. When you buy with a Debit card you bought it. If there is a problem, whose money do you think the bank will work harder to protect – theirs or yours? If you are buying something online from a seller you have not dealt with before. There are a lot of phishing scams and bogus websites out there – would you rather give them a credit card number or a direct line to your bank account? For this reason I have recommended that Internet Newbies use a low-balance ($100 or $200) Credit Card when ordering from unfamiliar online merchants. If you “overdraw” your Credit Card, the CC company will decline the transaction, which can be embarrassing. If you overdraw on your debit card, the bank will pay out… and then eat you alive with charges and fees. Having said all this, I have to say that I do not recommend using Credit Cards. That seems an odd thing to say, but what Dave calls “snake charming” requires iron discipline and concentration, and most people cannot do it – giving them a credit card would be like giving a drunk a drink. You have the money. You have the money in the bank to pay off the card. You have it now, not at some point in the future. 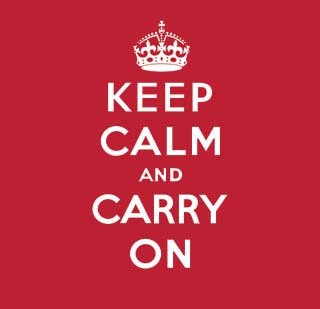 Using a credit card to “live now, pay later” is courting disaster. You NEVER carry a balance. Only fools carry a balance on their Credit Cards.You pay off the bill when it arrives: Don’t play chicken when due dates. They are praying that you miss the deadline. You have zero tolerance for fools: The moment that they do anything that annoys you, you are willing to cut up and cancel the card. Of course you can only do this if you have a zero balance… in the last six months I have canceled two of my three cards because the card issuers annoyed me. You don’t care about your FICO score. Only people with money in the bank can afford to cancel their credit cards. Ironically this hurts your “I-Love-Debt” score (also known as the FICO score). I recently cancelled a year-old Discover card and my FICO score went down by 18 points. Water Heater (old one broke). In every case, the money to repay the balance was already in savings (sounds odd, but it takes about a week to move money from my savings, which is by design). In every case the balance was paid off in full. Any other use is unacceptable. “Buy it with a credit card only if you can already afford it“.